Alex Theoharides (@Minne_Pop) evaluates the Timberwolves after the first half of the season and takes a look at their potential playoff chances. The Timberwolves are a much-improved team. Kevin Love has gone from being a borderline All Star to a potential first team All NBA player. The addition of Ricky Rubio has energized both the team and the Minnesota fan base. Head Coach Rick Adelman has proven to be a steady coach, capable of designing a system that highlights his players’ particular skill sets (re: lots and lots of pick & rolls). Most importantly, after 5 years of playing ugly, losing basketball the Wolves actually have a chance to finish the season with a winning record. On the way, they have become basketball darlings, widely hailed as being the most fun NBA League Pass team (which makes them the girl you want to go home with but don’t want to date, if you catch my drift). The Wolves have one All Star in Kevin Love and two Rising Stars in Ricky Rubio and Derrick Williams. They have won games on last second 3-pointers, made foul shots, and floating runners; and they have lost a game because of Martell Webster’s hair. 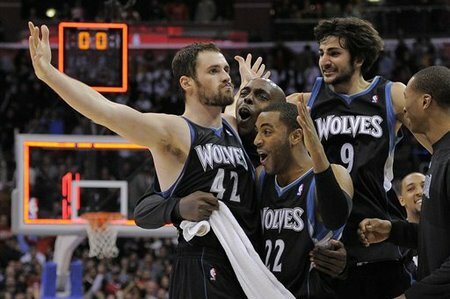 They’ve inspired band names: Ricky Rubio & the Howling Wolves or The Kevin Love Five. And references to beloved (if overly reliant on the musical chops of Rockapella) educational TV programs from my youth: Where in the world is Nikola Pekovic? ESPN’s Zach Harper likes to call the team “Puppy Breath and Cinnamon.” As of All-Star weekend, the newspaper Win-Loss columns read 17 & 17 while David Kahn prayed for more manna from heaven aka a playoff berth. The question is, can the future be now? Over the past few seasons, the Chicago Bulls and Oklahoma City Thunder managed to scrap their way to low playoff seeds, before playing and losing close fought series. Both teams are now among the favorites to win the NBA Championship. If the Wolves are going to be considered a legitimate contender in the future, it’s imperative that they, at the very least, continue to compete for a playoff spot. Is it reasonable to believe the Twolves could actually grab the 8 seed in the Western Conference this season? I’ll get there. First let’s break down their first half. First half MVP: Kevin Love made this choice easy. He averaged 25 points and 14 rebounds, stomped on Luis Scola’s face, hit a game winning three against the Clippers, handed out free tickets to fans, hit game winning foul shots against the 76ers, recorded a podcast with Bill Simmons, met up with fans in Uptown & West End to give out gear, and even made this cynic learn to love him. In other words, he showed up to play. And if (a very big if) the Wolves make the playoffs, Kevin Loves deserves to be mentioned as a MVP candidate (I’m not completely a homer—he shouldn’t win, just be in the top 5 or 10). First Half LVP: Darko Milicic’s terrible first half was partially obscured by the emergence of Nikola “T-Pek” Pekovic. However, it can’t be ignored how bad Darko has been. He only played in 23 of the 34 games, averaged a measly 4.9 points and 3.7 rebounds, and recorded a dismal +/- of -67 for the first half. His best moment of the season came against the 76ers, when he came into the game in the closing seconds and knocked down a potential game winning lob pass. His total time played in the game? 0.01 seconds. That grueling stretch was apparently long enough for Darko to get inured. He’s shown flashes of being a competent defensive player; however, his offensive skills seem to have regressed from last season. Best Surprise: #Montonegrinsanity! Somehow Nikola Pekovic, a player whose game I once described as, “if you have six fouls, you may as well use all of them” has become the Timberwolves’ third best player. He’s averaging 12.5 points and 7.2 rebounds, and making at least 4.5 opposing big men wet themselves every game. Don’t believe me: just ask Damarcus Cousins. The best part of his game is that he knows his lane. Almost all his shots come from layups, dunks, put backs, scary looks and meat-hooks. He makes his foul shots. And he runs the court. There’s not much else you could ask for in a big. Biggest Disappointment: The ‘Sota - ‘Cuse connection. I’m starting to think David Kahn owes Syracuse coach Jim Boeheim a very substantial sum of money. Either that or Boeheim hates Minnesota. How else to explain why the two players the Wolves drafted high in the first round from Syracuse (Jonny “Can I buy an H” Flynn and Wes Johnson) have both bombed. Okay, there are many better, more rational ways to explain it. For instance, it’s never a great idea to draft players who primarily played zone defense in college, let alone players whose stock rose due to one great game (re: Flynn’s fantastic performance in Syracuse's six overtime win against UCONN in the Big East Tourney). Flynn now plays for Houston; sadly the same cannot be said of Wes Johnson, who has the second worst +/- on the Wolves at -54. 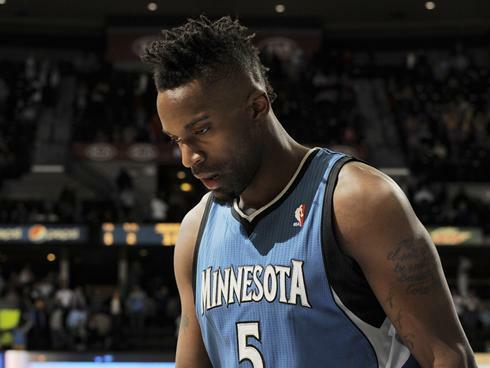 All the Wolves need is for Johnson to become a semi-decent wing player. With opponents forced to double team Love and Pekovic down low, Johnson consistently gets … and misses … wide open corner threes. This years, he’s shooting a paltry 22% on 3-pointers and is averaging just under 6 points a game. The refrain from team brass is that Johnson can shoot; he just needs to regain his confidence. I hope so. But if he continues to miss open shots, it’s difficult to imagine he’ll regain his confidence. Currently, Adelman is employing the strategy of penciling Johnson as the team’s starting small forward, then replacing him with Derrick Williams or Martell Webster late in games. However, it might be time to start Webster and see if Wes Johnson performs better when matched up against opposing team’s second units. He couldn’t play much worse. Key Stat: 16.21 turnovers per game. That number is third only to New York & OKC. Unlike the Thunder and Knicks, the Wolves don’t have enough scorers to make-up for such a high turnover rate. If the Wolves are going to continue to win close games, the team’s’ trio of ball handlers (Ricky Rubio, Luke Ridnour and JJ Barea) need to do a better job of deciding when to be aggressive and when to slow down the ball. Far too often, teams have been able to (literally) steal games from the Timberwolves. Barea, in particular, has a frustrating tendency to cause turnovers that lead to easy fast break points for the opposition. Best Fashion Statement: A three-way tie between Brad Miller, Luke Ridnour, Kevin Love & Ricky Rubio’s Taco Trey Kirby-esque hipster beards, Rubio’s HELP! meets Demi Moore haircut and Pek’s tattoo. Worst Fashion Statement: Martell Webster’s hair. Tweet of the First Half: Following Anthony Tolliver means I no longer have to feel guilty about skipping church (I wasn’t really feeling too guilty). Almost everything Rubio tweets is hilariously adorable because he doesn’t really habla ingles (Don’t worry Ricky, I don’t habla ingles very well either), and he ends up saying things like, “How is coming to TargetCenter tonight?” or spelling the Wolves cheer, “HOOOOOLW.” Kevin Love is also a master tweeter, mostly using his handle to generate buzz and give away free tickets. However, the tweet of the first half comes to us from Martell Webster. Let’s just say it involves three rookies and three very cute backpacks. Local Chatter: Lots of vitriol directed towards Wes Johnson, Webster’s hair, and Darko’s “injury” after playing .01 seconds of a game. Also a lot of trade talk. Mostly, involving whether or not the Twolves should trade away Derrick Williams and JJ Barea for Pau Gasol, thus turning Minneapolis into Madrid East. For the record, this move seems desperate to me. The Wolves don’t know what they have yet in Derrick Williams. He played his best game of the season on the last night of the first half against Utah. If he could develop into a productive small forward (the worry is he might be more of a power forward) the Wolves would have a true nucleus to build around. Pau is incredibly talented. However, while I do believe he’d be excited to play with Rubio, going from L.A. to Minnesota would have to be an emotional letdown—especially for such a sensitive guy. With Love and Pek playing so well, there’s also some question as to whether or not Pau is really the type of player the Wolves need to add to the roster. The real question, of course, being: Will Pek continue to be as successful in the second half of the season when teams start to double team him down low? A Cynic Says: My fear is that everyone in TWolves nation (a small nation, populated mostly by aging hipsters) is celebrating too early. Reaching the .500 mark at the All Star break is a huge accomplishment for the young Wolves; however, the All Star break should be a time for the players to relax and refocus—not to celebrate. When the All Star break ends on Tuesday, the Wolves face a brutal, 3 games in 3 nights, road trip followed by an equally tough trio of games at home. An Innocent retorts: The Wolves already beat the Clippers once. They played terribly in their loss to the Lakers. They can beat Phoenix. And they need to beat Portland if they want to make the playoffs. If they can win 3 of these 7 games, they’ll still be in good shape. Fearless Prediction: For most of the second half, the Wolves will struggle to remain close to .500. However, two of the teams above them (most likely, Houston and Denver) will get hit by injuries and fall out of the race, allowing the Wolves to slip into the playoffs as the 8 seed. Followed by the head Puddler himself, Mr. Matt Domino, booking a trip to Minneapolis to attend a Wolves-Thunder playoff game. Come on Wolves, lets make this happen!